Duncan Oakley - I want a comedy night! 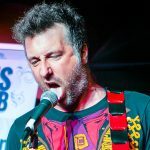 Duncan powers out a deft blend of stupidity and truly impressive musicianship with hilarious results. An easy confidence and good natured banter make him a regular at all the best venues. Lesser musical comedians hide behind their guitars and use them as a shield but his is definitely a sword as audiences who have been slain with laughter will gladly testify!